DEVIL ISLAND, Antarctica -- Antarctica is the coldest, driest and windiest place in the world but during the high summer, it can feel decidedly mild. From the top of Devil Island, off the eastern edge of the Antarctic Peninsula, the watery sun reflects off the vast tabular icebergs drifting around the Weddell Sea. 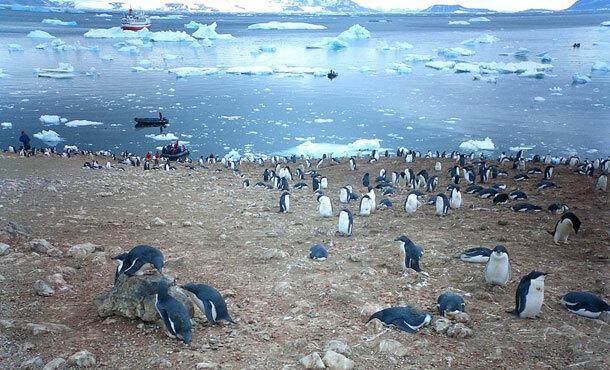 At the base of the island, as many as 20,000 pairs of Adélie penguins make their home. Moored offshore is the MS Explorer, a 75 meter cruise ship which can take up to 105 passengers. 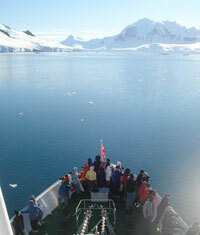 Four inflatable Zodiacs dart back and forth from the vessel, bringing tourists to shore to see the penguins up close. Mary Brogan, 55, from Dublin, has been planning this trip for over a year with her husband and five friends. But now she's here, she says she worries about the impact of tourism. "We definitely disturb the wildlife by coming here," Brogan says. "There are crowds of us on the beaches, sticking cameras in the poor penguins' faces." Tourist numbers are rising to Antarctica even though this is a high-priced vacation. A 10-day cruise trip costs upward of $4,000 but the number of visitors has doubled in the last three years to nearly 30,000. Dr Shannon Fowler, 32, from California, is a marine mammal biologist and lectures to the passengers on board Explorer. "I do face a personal dilemma about bringing tourists here but if people can't see something, will they really want to protect it? If you blocked tourism, how many people would say, 'no, you can't mine here' or 'let's protect this place'?" More tourism will raise public awareness about Antarctica's unique ecosystem but there are also fears about higher traffic to the region. Cruise ship accidents remain one of the biggest threats to the environment. Last month, the MS Nordkapp cruise ship hit rocks near Deception Island, off the Antarctic Peninsula, spilling diesel oil into the bay. Stephen Anstee is Explorer's Expedition Leader. 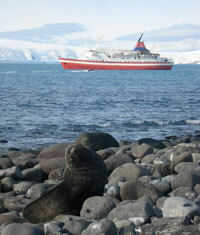 "We are getting close to capacity in Antarctica and as the ships get bigger, so do the environmental risks. We will need stricter controls as tourism grows." Most travel companies in the region subscribe to IAATO, the International Association of Antarctic Tour Operators, which sets guidelines to manage tourism here. The problem is IAATO is a voluntary self-regulated organization and anyone can opt out of the system. Because no one owns Antarctica, no one is responsible for the continent's safeguard. For better or worse, the future of Antarctica may depend on how many people choose to save up and make the once-in-a-lifetime journey. Mary Brogan agrees. "Of course I am going to tell my friends about Antarctica when I get home. But am I doing any good encouraging them to come here? It's hard to know."